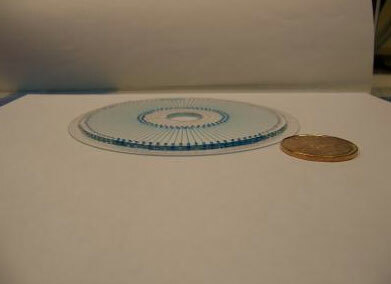 (Nanowerk News) DNA microarrays are one of the most powerful tools in molecular biology today. The devices, which can be used to probe biological samples and detect particular genes or genetic sequences, are employed in everything from forensic analysis to disease detection to drug development. A palm-sized biochip for room temperature DNA detection developed by Paul Li at Simon Fraser University near Vancouver, Canada. The 4" diameter chip is roughly the same thickness as the Canadian one dollar coin, the Loonie (shown in the picture for scale). The key to Li's result: gold nanoparticles. Suspended in liquid and mixed with DNA, the nanometer-scale spheres of gold act as mini magnets that adhere to each of the DNA's twin strands. When the DNA is heated, the two strands separate, and the gold nanoparticles keep them apart, which allows the single strands to be probed with other pieces of DNA that are engineered to recognize particular sequences. "It's faster and requires a relatively small sample," he says, adding in his paper that "the whole procedure is accomplished at room temperature in an hour and apparatus for high temperature… is not required"